Due to our devoted vendors, we have been accomplished to offer an extensive range of MS Hexagonal Head Bolt. Hexgon head bolt ( half thread). Diameter : M3-M42, 1/4" to 1"
Length : 20-300MM, 3/8" to 9"
Sudhir Automotive Industries Pvt. Ltd.
- Diameter: M4 - M64 1/4' - 2.1/2"
We are amongst the most prominent company presenting Nut and Bolt. We verify these products in compliance with set industrial standards to provide optimum satisfaction. Besides, these products are available in various sizes & length as per clients’ satisfaction. Sensing the requirements of industries, we offer our all inclusive range of Hex Head Bolt , which are known amidst our clients for their enhanced tension tolerance, toughness, dimensional stability and sturdy construction. 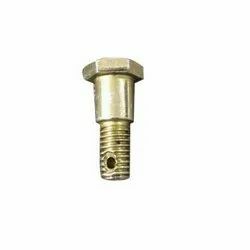 We are involved in providing an extensive range of hex head bolts. Manufactured using top quality raw material, these are known for excellent strength, durability and wear & tear resistance. Available in the various shapes, sizes and finishes, our range of product is widely used in fastening the parts of machines and structures.